I struggled a bit with the title for this post. 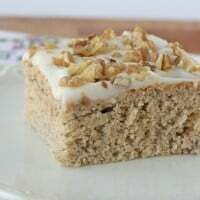 I wanted to title it “Amazing Banana Cake…” or “Delicious Banana Cake…” or “Amazingly Delicious..” In the end, I left the title simple and to the point, but let me add here… this banana cake is amazing, it’s delicious, and it’s quite easy to make! Go now and put your bananas in a paper bag- so they’ll ripen faster, and then you can make this cake! I experimented with several recipes before settling on the ingredients and proportions listed below. I was so happy when I tasted the first slice of this cake! Then I “sampled” a couple more slices, just to make sure they were equally good! This cake is sweet, fluffy, moist and flavorful. To answer the question… “what’s the difference between banana cake and banana bread?”, this cake is similar in flavor to a wonderful banana bread, but lighter and fluffier. And certainly, the addition of delicious cream cheese frosting makes this recipe sweeter, and more decadent than banana bread. 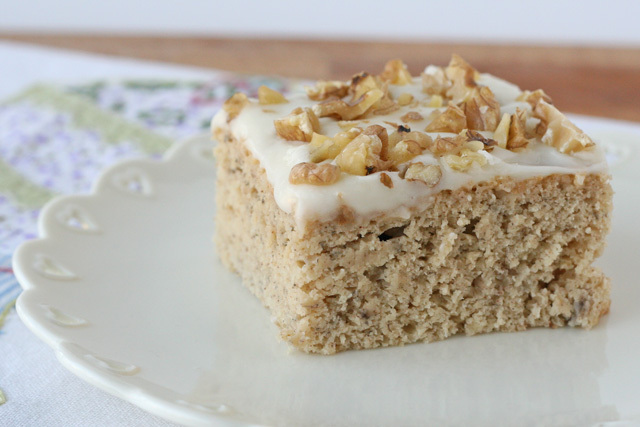 This cake is easy to prepare and is a delicious way to use over ripe bananas. 2 teaspoons milk or cream, if needed to thin frosting for easy spreading. Grease an 8"x8" pan (with butter or non-stick cooking spray). In a large bowl, whisk together sugar, sour cream, eggs, melted butter, mashed banana and vanilla. Whisk (can be done by hand, or with electic mixer) until fully combined. Add flour, cinnamon, salt, baking soda and baking powder, and stir with whisk or spoon until fully combined and smooth. Pour batter into prepared pan, and bake at 375*F for about 30 mintues (check after 25 minutes). Bake until a toothpick inserted in the center comes out clean, or with a few moist crumbs, but no wet batter. Cool (in pan) on wire rack. In the bowl of an electic mixer, or with an electic hand mixer, beat butter and cream cheese until smooth. Slowly add powdered sugar, then add vanilla. Add milk or cream, if needed to thin frosting for easy spreading. Spread frosting onto cooled cake (make sure the cake is cool, or the frosting will melt). Top cake with chopped, toasted nuts, if desired. This recipe as is makes an 8"x8" cake. I'm sure you could use a 9"x9" pan if desired, but you will likely need to reduce the baking time a bit. If you'd like to make an 9"x13" cake, I'd recommend increasing the recipe by 1.5 or doubling the recipe. You will have to adjust the baking time accordingly. The cake is done when a toothpick inserted in the center comes out clean, or with a few moist crumbs, but no wet batter. This cake comes together quite easily, and would be perfect to prepare and pop in the oven right before dinner, then it can bake and cool during dinner, and be frosted and enjoyed for dessert. If you’re lucky, there may be a piece or two left over to enjoy in the morning! My parents in law are comemorating their 50th anniversary next week. I might be taking them a cake like this one! Thanks! 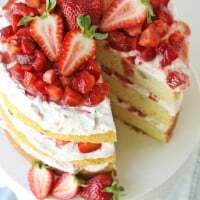 WOW, this cake sounds incredible, and I have several over-ripe bananas just waiting to be used I think I might double the recipe and make a tiered cake for dessert tomorrow night. Thanks for the great idea!! Yum, banana cake is my go to when I have banans over ripe. It makes a great gift, because if it stays in the house, it ends up on my…..well, you know what I mena! I have been looking for a recipe to make with overripe bananas other than the usual bread, so I’m so happy to have found this. Your recipes are always so delightful! That looks AMAZING. I used to have a crazy ex – his most redeeming feature was that his grandmother (who was also crazy) made awesome banana cake. This looks amazing Glory! I’m always on the hunt for babana cake recipes, my mom loves them! This looks delicious!! I love the cream cheese frosting!! thanx for sharing! It certainly does look both amazing and delicious! great, now I want to go get bananas just for this! Yum! Love the mini milk bottle glasses too!!! Love banana breads and cakes. I’ve never done one with the cream cheese frosting & the walnuts. Looks delicious. My son loves bananas, but as we are in Summer the hot weather makes the banana get over ripe very fast, so at then end I have some brown/black banans at the freeze. And now us when I need different banana recipes and I love how this cake looks. I will bake one. 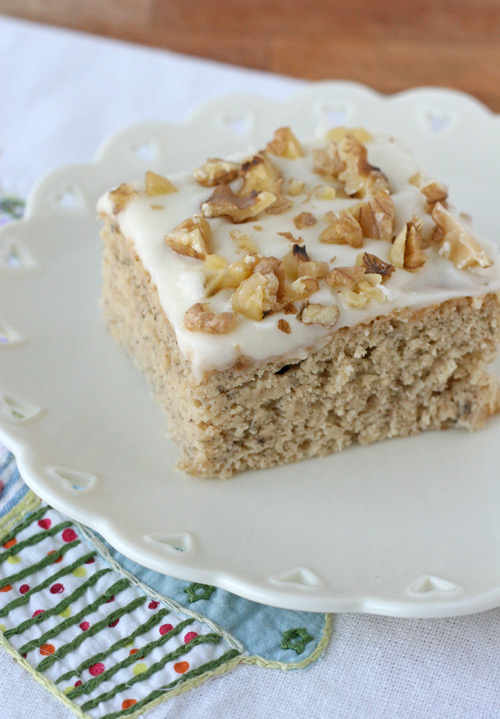 We love banana cake around here. . .can’t wait to try this one! I’ve only found your website earlier this week (whilst trying to find the perfect cupcake recipe!) and I’m so glad I have. I’ve been reading it nonstop, you have really inspired me to bake more. You are amazingly talented! This cake is amazing! The best banana cake I have tried and made. And the cream cheese frosting is perfect! I made this last night for dessert and the whole family loved it! I had to hide a piece last night so I could have it for breakfast this morning! P.S. I didn’t have an 8X8 pan, so I used my 9X13. I made a single batch, so It wasn’t as thick as your picture and the baking time was only 20 minutes. Lily, I have not yet made it as cupcakes, but I imagine it would work well. Feel free to experiment. Happy baking! This looks so delicious – I can’t wait to try making it! Your banana cake looks delicious! I also love your presentation – where did you get the cute plates with hearts cut out? Can’t wait to try the recipe!! 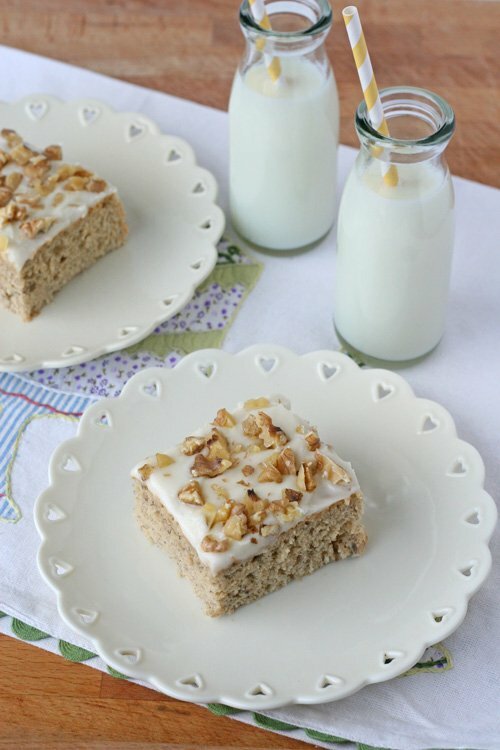 This cake looks delicious – a great change to loaves of banana bread. The cream cheese icing sounds like the perfect pairing! Fabulous cake! Very moist and yummy. I was going to making the cream cheese frosting but never got the chance. While it was cooling my husband asked if he could cut a piece. I told him I need to frosting it. He said he doesn’t need frosting and cut a big hunk off! In no time it was half gone! Next time I’ll make it when he’s NOT home so I can try it WITH the frosting! Where did you get those cute little bottles from? Those look delicious! Where did you get those beautiful plates?? Just made this cake, and it was a big hit with the hubby. Thanks for posting! Hi – Do you think I can use greek yogurt instead of sour cream? If I were to make these into cupcakes, what would the modifications be? This was so easy (even for a non-baker like me) and turned out quite good! The only “complaint” I would have is that I have an overabundance of icing left over…… probably enough for 3 of these sized cakes! I’m not sure how that happened? Thanks for sharing your recipe! I stopped here via a Pinterest posting to look at your pretty pictures. First of all, I really love your site! Your decorations and recipes have inspired me to bake more. I made this yesterday into cupcakes and what can I say, it turned out perfect! It came out beautifully just as you described it – light and fluffy! I can’t wait to try more of your recipes. I made this this past week, it is delicious! Wish we had leftovers but we don’t! I can’t wait to try other recipes! This banana cake is delcious, infact all the recipes i have tried off your site are delicious. Simple ingredients and easy to make. I look forward to trying more. I am making this right now. I found that I had to bake mine longer than the time in the recipe. Just hope I didn’t dry it out. Can I use regular margarine orbutter instead of challenge butter? Yes, feel free to use any brand of good quality butter. I would never suggest using margarine to bake with. I’m cooking for a diabetic. How will the muffins turn out if I omit the sugar? Should I add more bananas instead? I’m using tiny tropical bananas, not the large ones. Thanks in advance! I have only made the recipe as listed. Feel free to experiment, but I would suggest you do need some kind of sweetener. 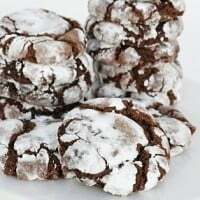 I tried this recipe my family loves it. It’s a keeper! I also make a gluten free version, trading flour for Gluten free Bobs red mill, also added a teaspoon of xanthame gum. (Spelling) Traded straight across on flours it came out sooooo good best cake that’s gluten free ever. Thank you for sharing! of nuts for texture. Outstanding! I might be making this delicious looking cake but I don’t have sour cream.Is there a substitute for it? This cake was delicious and just the right size. 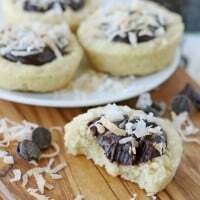 How can I share this recipe on Pinterest for all my friends to see?